(from left to right) Phillip Agnew, Nicole Markus, Monica Espitia and Juan Cuba lead a discussion about how to protest effectively at a meeting on March 7 after school in the media center. Students have organized a walkout for March 14 at 10:00 a.m. 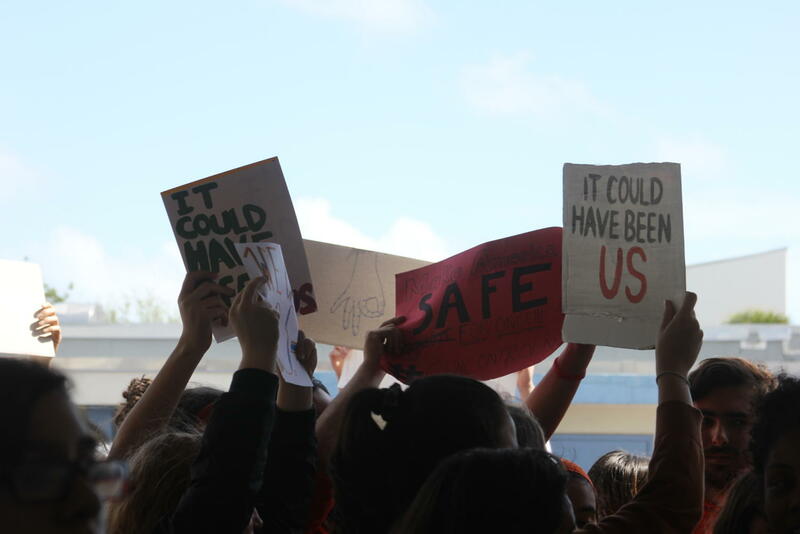 Though Palmetto’s February 21 walkout against gun violence did not go as she had planned, freshman Nicole Markus thinks that next week’s protest on March 14 at 10:00 a.m. will run much more smoothly. “I am extremely hopeful about this protest because I truly believe that everyone has it in them to be respectful and mourn for the victims lost properly,” Markus said. 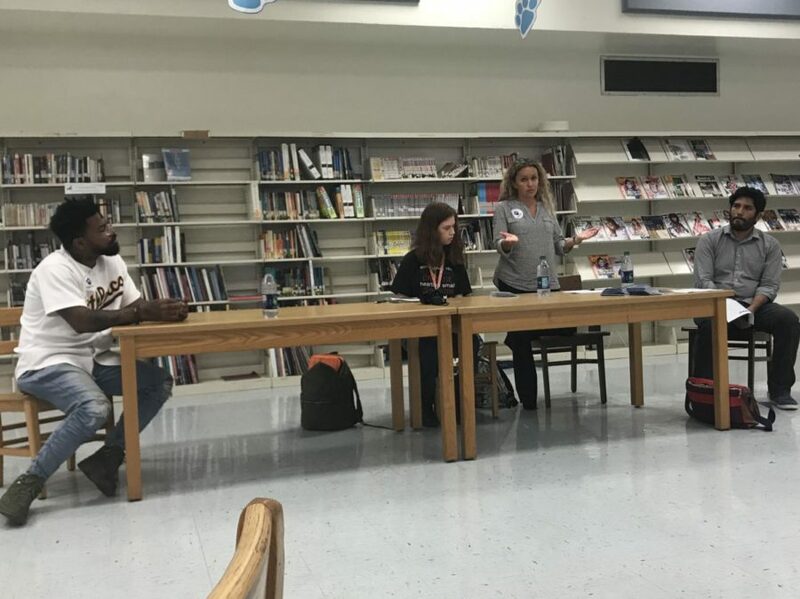 On Wednesday March 7, AP Psychology teacher Gwendolyn Schoolar brought speakers to an after school discussion with Palmetto students in the media center about how to protest effectively in preparation for next week’s walkout. Schoolar said she wanted to bring the speakers in the aftermath of last month’s protest-gone-awry. “Those that were interested [in protesting gun violence] felt that there was a lack of organization,” Schoolar said. The February 21 walkout— occurring a week after the shooting at Marjory Stoneman Douglas High School in Parkland, Florida that left 17 dead—, took place in the Pawvillion at noon during second lunch. While the administration had allowed for a 15 minute walkout, from noon to 12:15, at the Pawvillion, some protestors made their way to the 118th Street gate by the auditorium and left campus. Some reportedly walked to Coral Reef Senior High School’s campus on 152nd Street in Richmond Heights, about 4 miles away from Palmetto’s campus. Some of the protestors themselves felt the event was disorganized and ineffective in getting their message across. Markus, founder of the group Students Against Gun Violence, helped plan the walkout with administration. Drawing of “gottem” meme among protest signs at the February 21 walkout at the Pawvillion. The event took place a week after the deadly shooting in Parkland, Florida. Protesters also said the Pawvillion during lunch was a bad location for the event. Many students that were not involved in the initial protest and were simply there for lunch moved with the crowd to leave campus. Some students also brought or made signs that seemed to poke fun at the event. Students chanting “we call BS” at the 74th Avenue gate as part of a protest against gun violence on February 21. The protest initially began at the Pawvillion during second lunch. Soon after this video was taken, students left campus as part of the protest. At the protest Ramirez referred to, counter-protesters going against those that protested the election of President Trump threw items like water bottles at their opponents. The protest took place during the first few minutes of fifth period, directly after second lunch. The plan for next week’s walkout on March 14, the date that will mark one month since the Douglas shooting, received more time in its planning and already seems to be more structured than its predecessor. At Wednesday’s meeting, principal Victoria Dobbs outlined the plan for the event, which she organized with the help of students. Students will be released by building to go to the field for the protest by 10:00 in the morning. On the field, students will stand in a heart painted on the grass by Athletics Director Steve Batten with #MSD next to it and remain silent for 17 minutes of mourning. A balloon will be released each minute of the protest to represent each of the 17 victims of the Douglas shooting and students are expected to wear Columbia blue. While Markus said she played some role in organizing the upcoming walkout, most of the work has been left to senior students. These seniors were absent from the meeting, mostly due to conflicts with pre-scheduled events. Schoolar called the meeting “last-minute” as it was organized quickly within the last few days. These senior organizers, including Melanie Ramirez, are aware of the administration’s general plan for the walkout but still need to confirm some details of the event, including speeches and poetry to be read during the event. The speakers Schoolar brought in for the discussion helped students refine the details of the protest. Phillip Agnew, head of the activist group Dream Defenders, asked students to define what their purpose was for protesting in order to send an effective message. Students responded with general answers like stricter gun laws to more detailed answers including more counselors in school, not arming teachers and a ban on high-capacity magazines. “Eventually, we would want a semiautomatic weapon and assault rifles ban but that’s not going to happen,” Markus said. Other speakers included Monica Espitia, South Florida regional organizer at the American Civil Liberties Union of Florida, and Juan Cuba from the Florida Democratic Party. 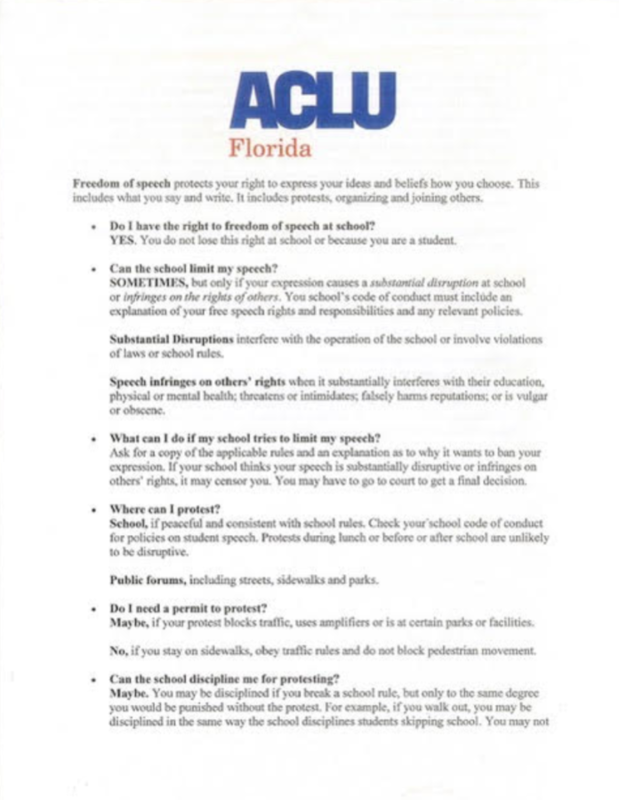 Espitia focused on the First Amendment rights of students and what they can do legally to speak out. Referencing the landmark 1969 Supreme Court decision in Tinker v. Des Moines Independent Community School District, Espitia reminded students that all speech in schools is allowed as long as it is not disruptive and/or offensive. If a student wanted to speak out by leaving class without permission or wearing something that blatantly violates school dress code, they can still receive disciplinary action from the school administration. “You don’t lose your free speech when you walk into school,” Espitia said. Cuba from the Florida Democratic Party proposed forming a permanent organization at the school that could coordinate events like these in the future. He emphasized the importance of organization in keeping a movement going. Students, faculty and the speakers are optimistic about next week’s event. “I think that what you all are doing is the most American thing you can do,” Agnew said.